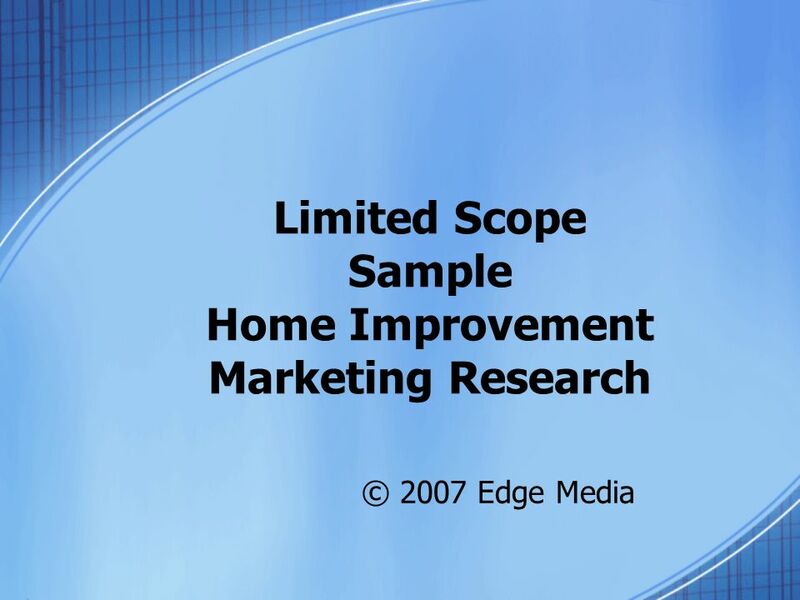 Limited Scope Sample Home Improvement Marketing Research © 2007 Edge Media. 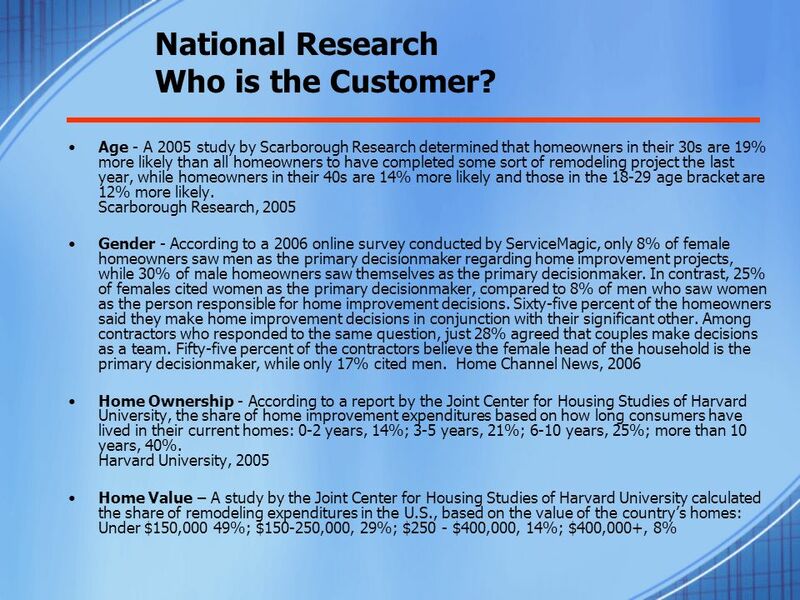 4 National Research Customer Spending Patterns Based on a survey by Scarborough Research, types of home improvement projects undertaken by homeowners in 2004 (multiple answers): Interior paint or wallpaper, 35%; landscaping, 30%; carpeting or floor covering, 18%; exterior paint or siding, 15%; remodeled bathroom, 14%; remodeled kitchen, 10%; heating or air conditioning, 9%; replaced windows, 8%; any addition, 4%; installed home security system, 2%; installed pool or spa, 2%. 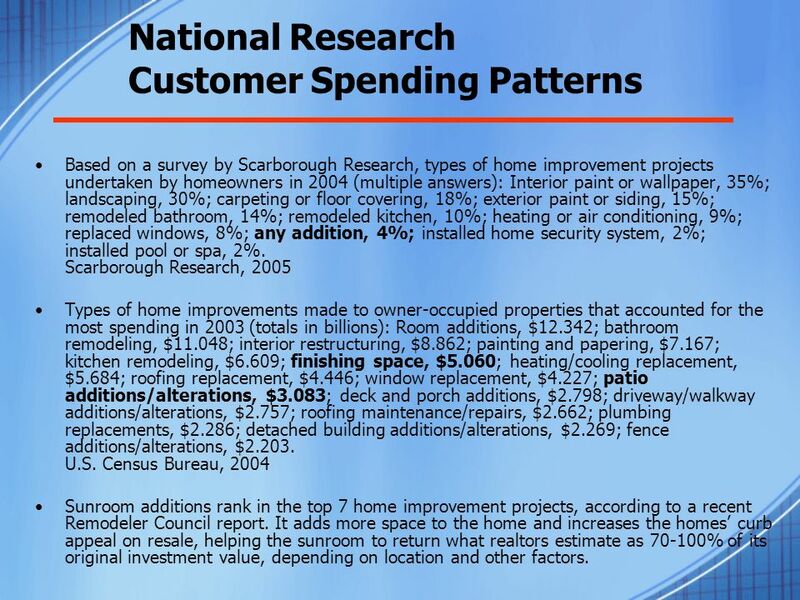 Scarborough Research, 2005 Types of home improvements made to owner-occupied properties that accounted for the most spending in 2003 (totals in billions): Room additions, $12.342; bathroom remodeling, $11.048; interior restructuring, $8.862; painting and papering, $7.167; kitchen remodeling, $6.609; finishing space, $5.060; heating/cooling replacement, $5.684; roofing replacement, $4.446; window replacement, $4.227; patio additions/alterations, $3.083; deck and porch additions, $2.798; driveway/walkway additions/alterations, $2.757; roofing maintenance/repairs, $2.662; plumbing replacements, $2.286; detached building additions/alterations, $2.269; fence additions/alterations, $2.203. U.S. Census Bureau, 2004 Sunroom additions rank in the top 7 home improvement projects, according to a recent Remodeler Council report. 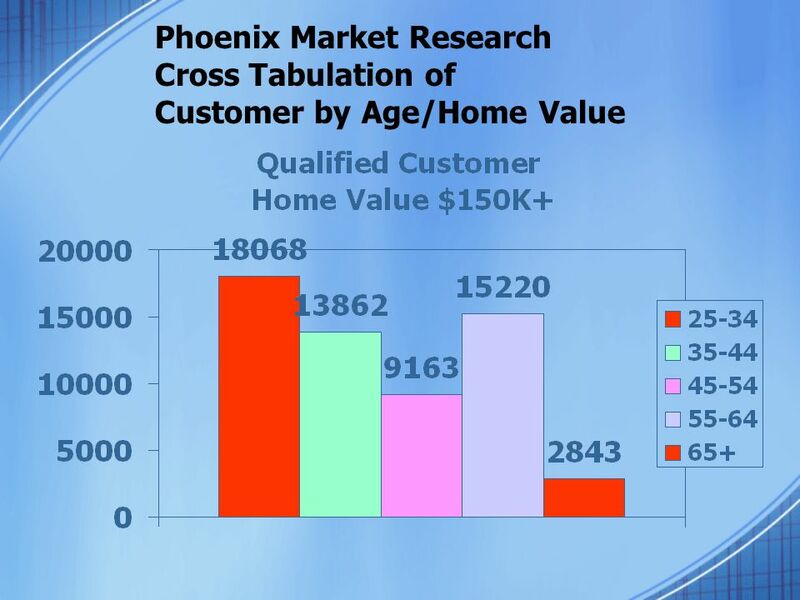 It adds more space to the home and increases the homes curb appeal on resale, helping the sunroom to return what realtors estimate as 70-100% of its original investment value, depending on location and other factors. 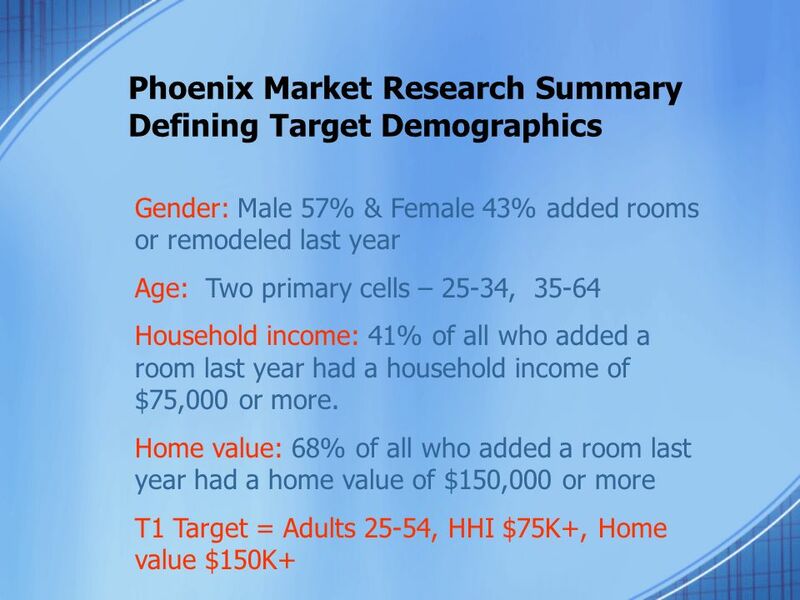 6 Summary of National Research Primary age cells: 30–50 years of age 33% more likely to remodel Gender: Female is the decision-maker Home ownership: 86% of remodeling is done by people who have lived in their homes 3 or more years 51% of all remodeling is done on homes with a value of $150,000 or more. 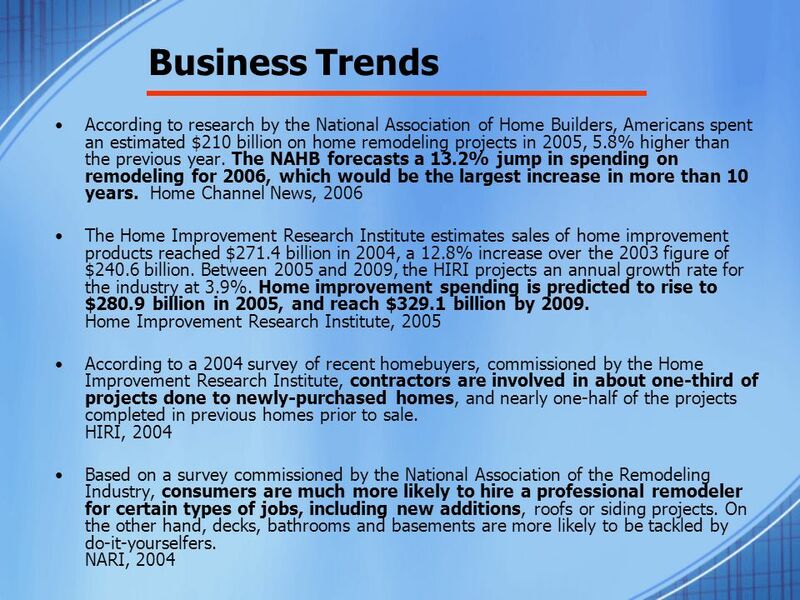 Home improvement category is projected to experience significant, continuous growth. 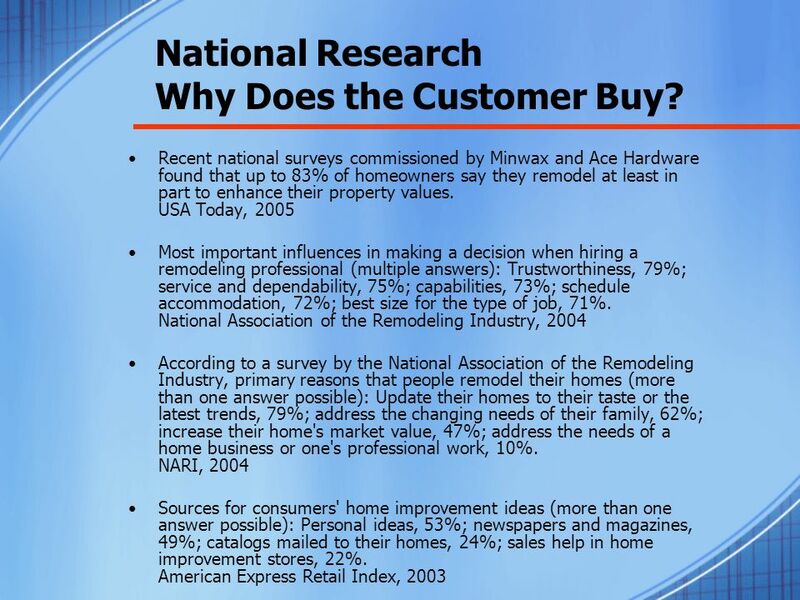 Contractors are valued for their trustworthiness and ability. 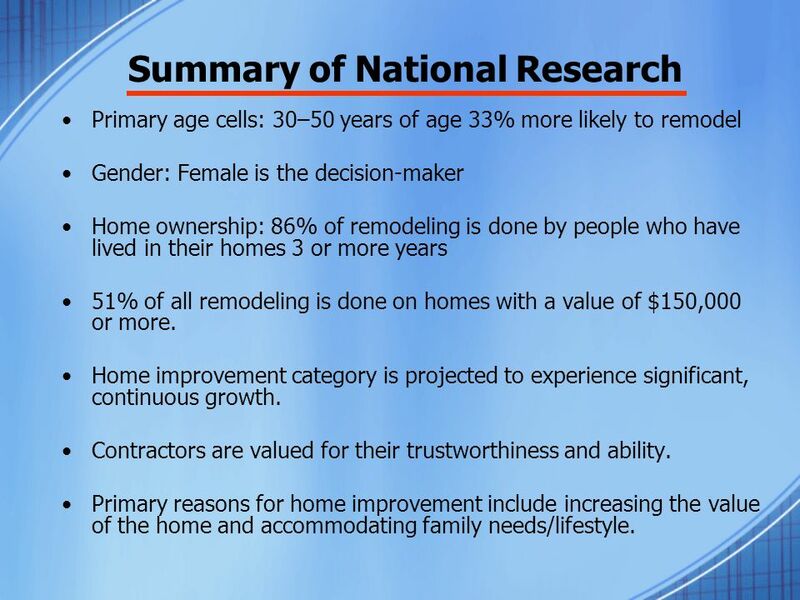 Primary reasons for home improvement include increasing the value of the home and accommodating family needs/lifestyle. 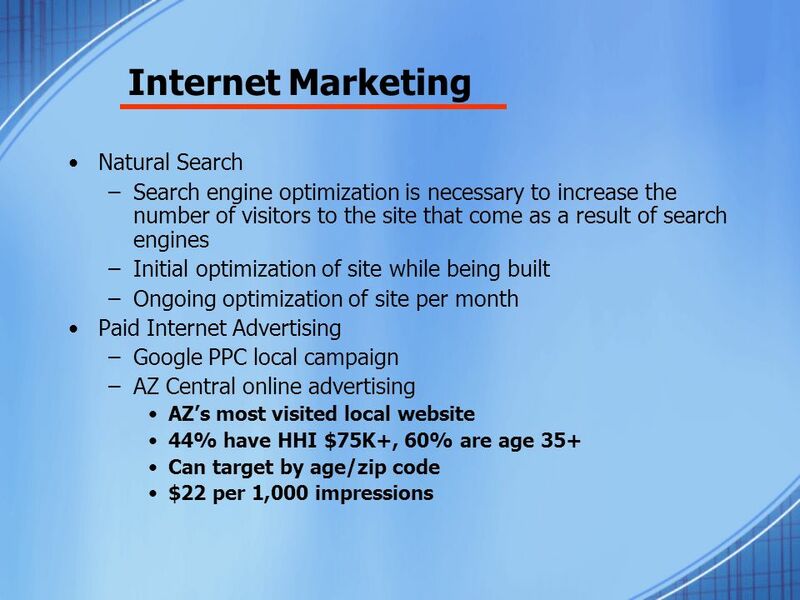 15 The Necessity of Using the Web in the Marketing Mix Pew Internet reports that 38 million Americans use search engines every day to research goods and services. 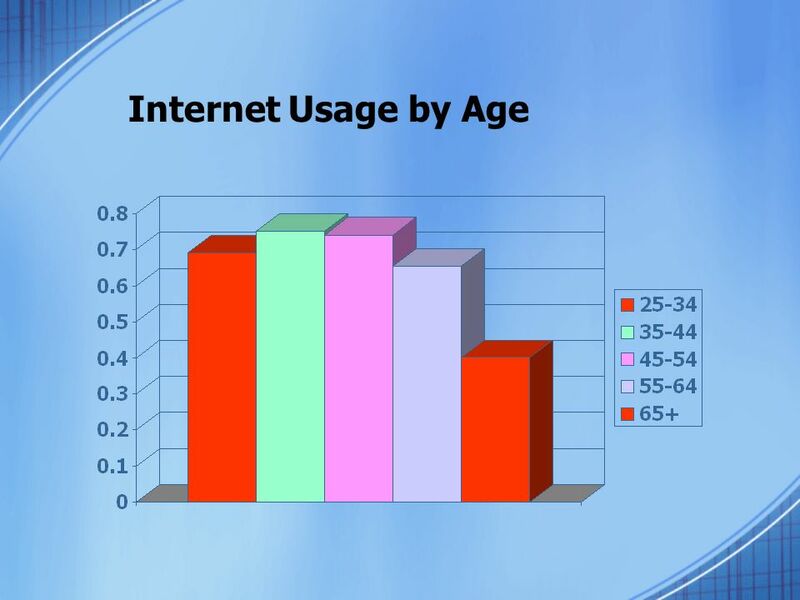 One fifth of internet users will use a search engine four times or more per day. 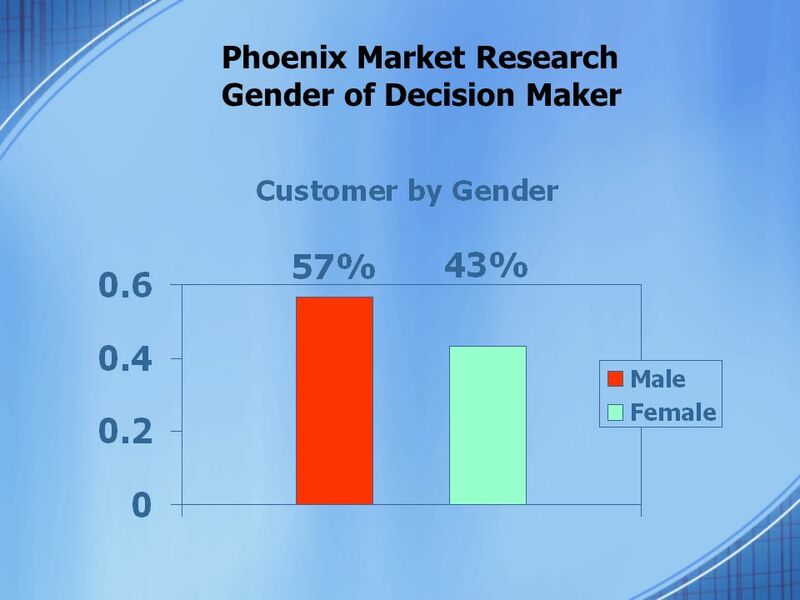 67% of U.S. adults who research online before making a purchase decision use search engines as a research tool. 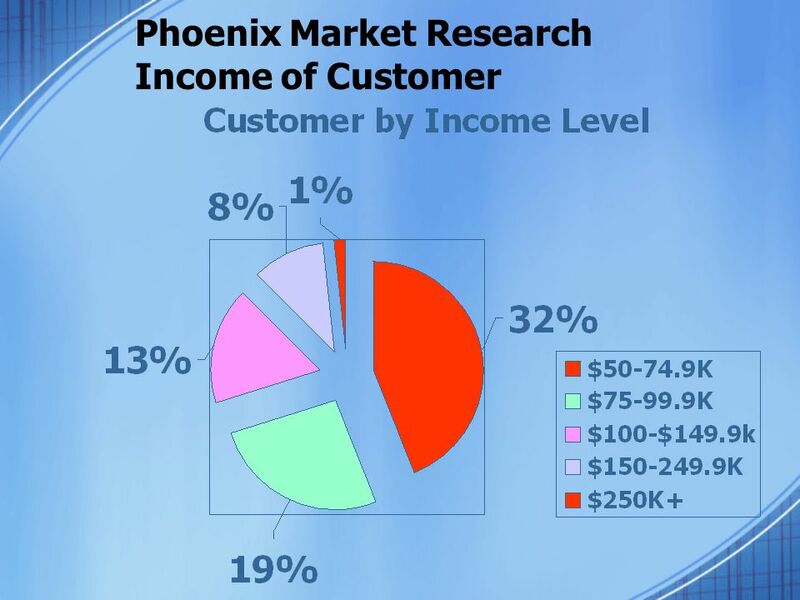 40% of those conducting online research go to search engines first. 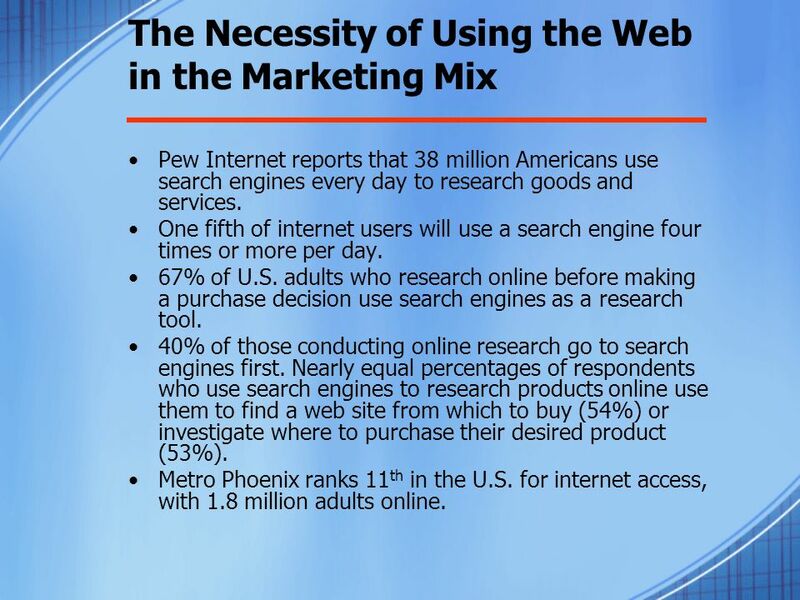 Nearly equal percentages of respondents who use search engines to research products online use them to find a web site from which to buy (54%) or investigate where to purchase their desired product (53%). 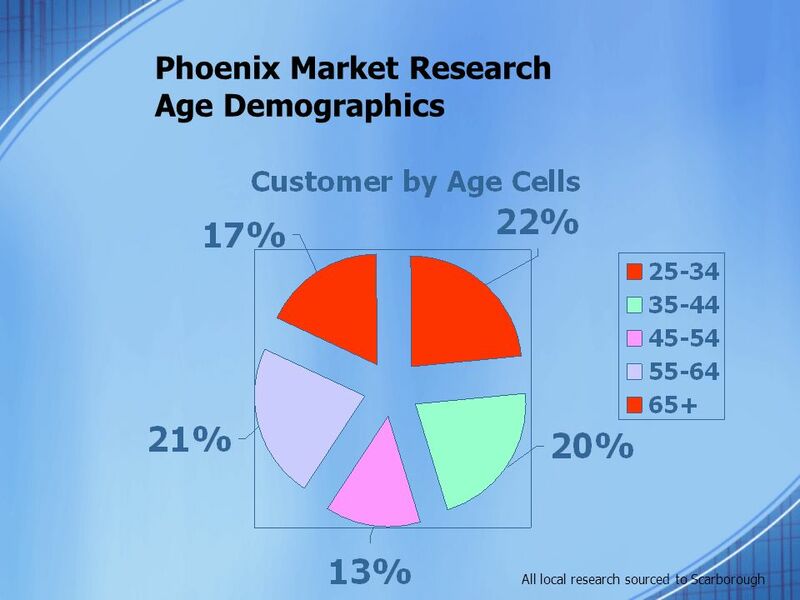 Metro Phoenix ranks 11 th in the U.S. for internet access, with 1.8 million adults online. 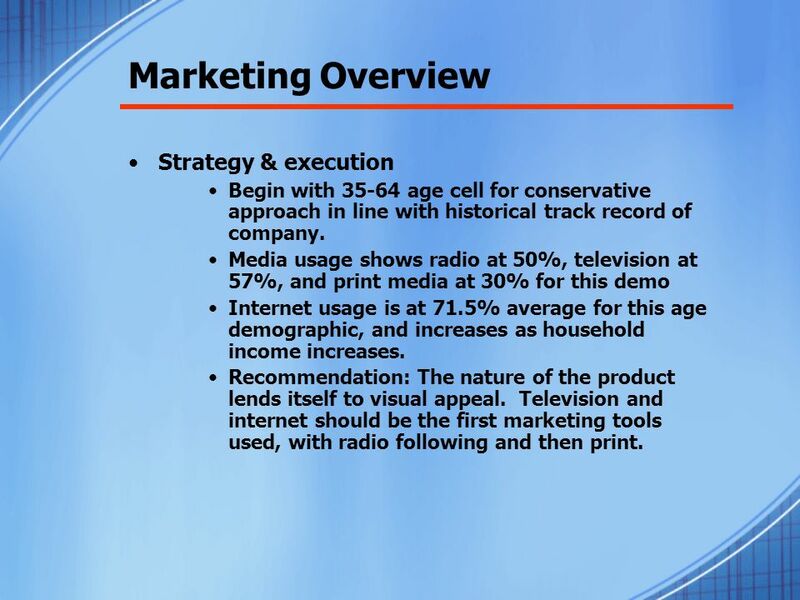 16 Marketing Overview Strategy & execution Begin with 35-64 age cell for conservative approach in line with historical track record of company. 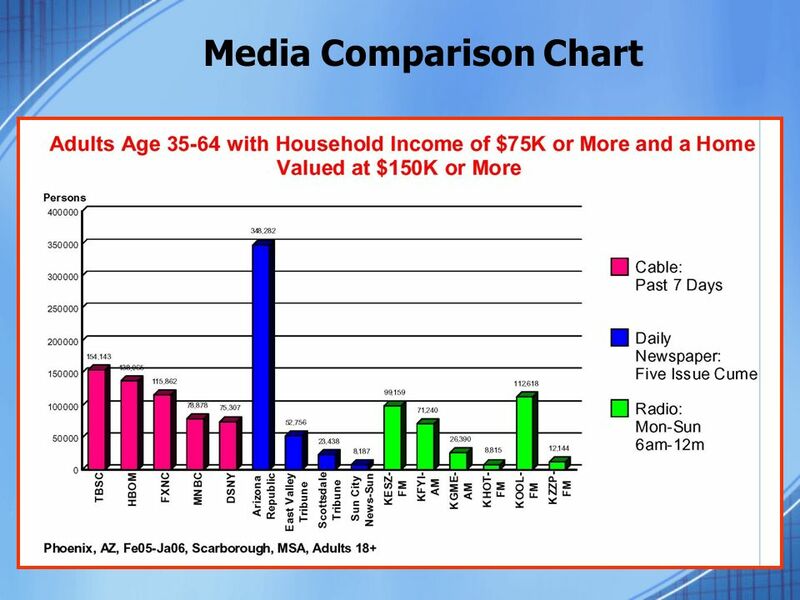 Media usage shows radio at 50%, television at 57%, and print media at 30% for this demo Internet usage is at 71.5% average for this age demographic, and increases as household income increases. Recommendation: The nature of the product lends itself to visual appeal. 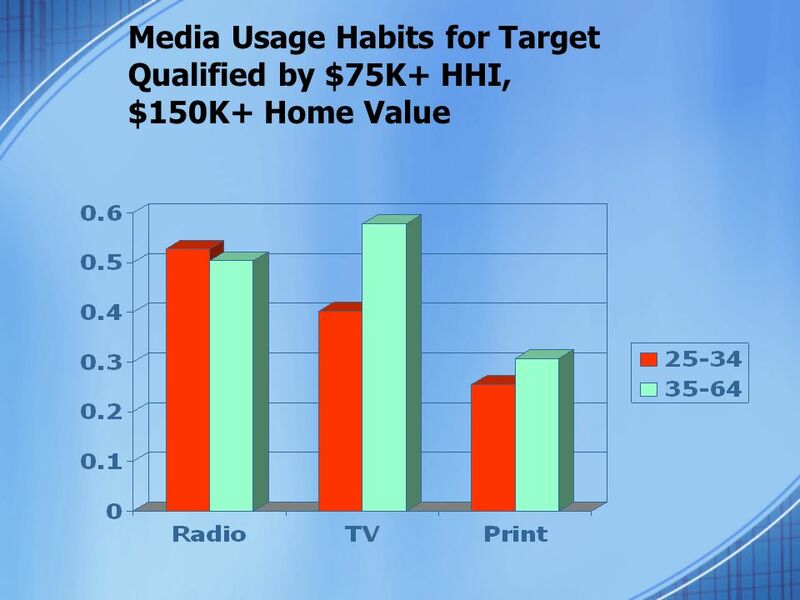 Television and internet should be the first marketing tools used, with radio following and then print. 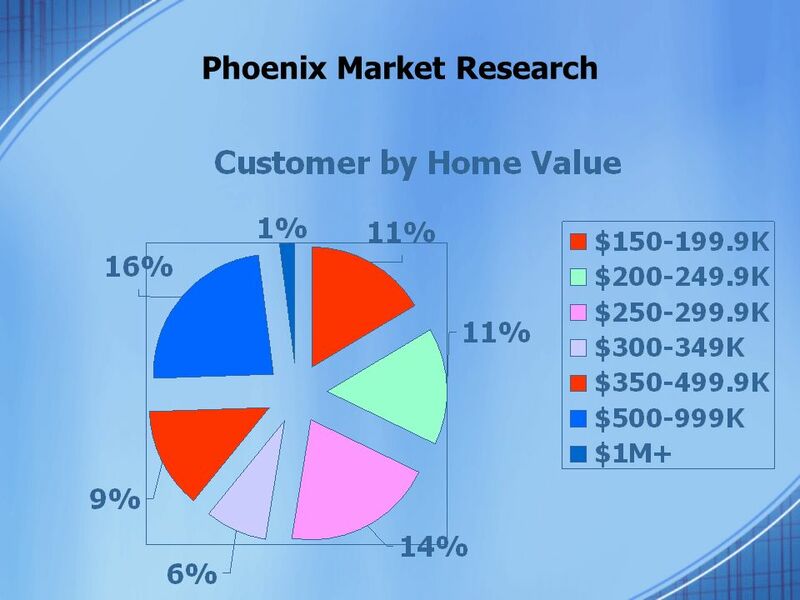 Download ppt "Limited Scope Sample Home Improvement Marketing Research © 2007 Edge Media."